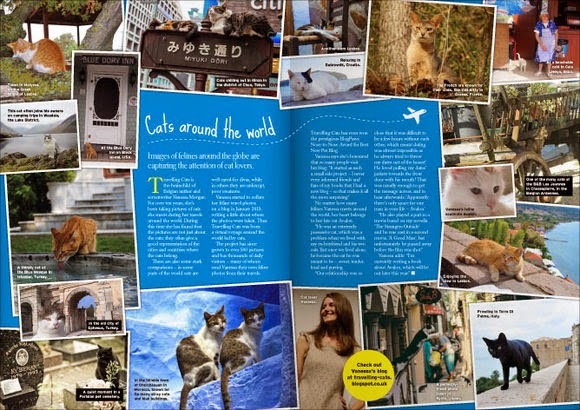 I'm proud to announce that my blog Traveling Cats has been featured in this month's issue of Your Cat. We talk about the beginning and evolution of Traveling Cats, and, of course, I couldn't help but share more than a few words about my beloved Avalon. There are lots of pictures as well. Make sure to get your copy. Bonjour chère Vanessa et merci beaucoup pour cette publication intéressante !!!! Félicitations ! Je t'embrasse bien FORT !!! :-) Bon mercredi ! Very cool to be a feature spread! That must be really exciting to have your blog featured. I read that over on the kitty blog. Huge congrats to you! Wow! Congrats! That is awesome and I am so happy for you! Congratulations! How awesome. And great exposure! Avalon's a star! Congratulations to both of you! Congratulations, Vanessa -- very cool spread.